Even as Boris Yeltsin's image experiences some rehabilitiation, Russians still harbor negative feelings towards Mikhail Gorbachev. Will he have to wait for the grandchildren of Perestroika to get his due? The first months of 2011 include important birthdays for two paramount figures in contemporary Russian history. The late Boris Yeltsin would have turned 80 on February 1; on March 2 Mikhail Gorbachev will turn 80. It is hard to imagine two more different people — in terms of personality, temperament and actions. But from a historical perspective, they are seen as twin brothers: One could not have existed without the other. It was then-General Secretary of the Communist Party Mikhail Gorbachev who invited Boris Yeltsin, then in Sverdlovsk (now Yekaterinburg), to come to work in Moscow. And it was Gorbachev who later fired Yeltsin from his post as first secretary (mayor) of Moscow, thereby laying the basis for Yeltsin’s incredible popularity among rank-and-file Russians. It is not surprising that in 1991 after the abortive coup, Gorbachev was virtually replaced by Yeltsin, who became the first president of Russia. On coming to power, Yeltsin decided to vent his old grievances by depriving Gorbachev of his large pension and security detail. 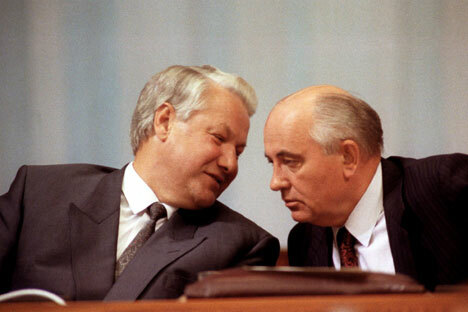 True, the scandal quickly evaporated and these former political foes reached a compromise — apparently Yeltsin’s colleagues abroad advised him not to waste time on trifles and not to touch “Gorby,” but the personal enmity remained and these two major political figures never saw each other again. As one Russian historian wrote, “In Russia you need to live a long time.” From this point of view, Mikhail Gorbachev has outstripped his old rival. But it would be interesting to know what he feels now, watching the celebrations of Yeltsin’s 80th birthday, grand celebrations on practically a national scale. All the major TV channels have shown documentaries portraying Yeltsin in an almost idyllic light. The Bolshoi Theater held a concert in his honor, attended by Vladimir Putin. In Yeltsin’s hometown of Yekaterinburg, a statue of Russia’s first president was unveiled. The unveiling was attended by the current president of Russia, Dmitry Medvedev, who gave a very moving speech. Mikhail Gorbachev is hardly likely to be accorded such honors — either in life or after his death. It’s not a question of the personality of one man or the other. Indeed it’s debatable whether Yeltsin deserves all these honors. Today an obvious effort is being made to paint him as a “fighter for freedom” and a “true democrat,” although this is more likely a myth. In the last years of his life, Yeltsin lost whatever popularity remained and became associated in people’s minds not with freedom, but with anarchy and permissiveness. Many regions of Russia were set adrift, and it was a miracle they didn’t secede altogether. State property was sold for kopecks to oligarchs, who became some of the world’s richest men literally overnight. Pensions and salaries were delayed for months, and sometimes years. In other words, the government disappeared from vital spheres of life, leaving people to fend for themselves. So when Boris Yeltsin decided of his own accord to resign, most Russians were relived. Finally. But even so, the mistakes and miscalculations made by Russia’s first president are as nothing compared to what Mikhail Gorbachev did. He destroyed the Soviet Union. From this point of view, Yeltsin merely continued what Gorbachev had begun: He went on destroying the communist system. That is why Gorbachev is so beloved in the West and so reviled in his own country. Recently the Public Opinion Foundation (FOM) began a global project called Historical Memory: the Emergence of a New Russia. The aim of this project is find out what Russians think about the period 1985-1999 when the fateful changes took place. Well, it turns out that 54 percent of the project’s respondents think that perestroika did far more harm than good. Only 16 percent think the opposite is true, while close to a third of all respondents could not say one way or the other. What’s more, this attitude toward perestroika is typical not just of older people, as one might have expected, but also of the group known as Internetchiks (37 percent of the overall number of respondents). Half of all Internetchiks are under 30. What do they associate perestroika with? Most of the answers were extremely negative: the collapse of the Soviet Union, the robbing of ordinary people, the ravaging of Russia, power struggles, changes for the worse. Only 7 percent of all respondents mentioned democracy and glasnost. In answer to the question, “When did perestroika end,” 43 percent of the respondents said that it was still going on, with no end in sight. Sociologists are still unable to explain this very negative attitude toward the changes that took place in our country a quarter century ago. Perhaps this negativity reflects dissatisfaction with current life, which can be traced to the changes, and the phantom pains from the collapse of a great country. Human memory tends with time to forget the bad. Moreover, the Soviet Union had many genuine achievements, which are sorely lacking in Russia today. For instance, free education and medical care for all. And the nationality question had been all but squared away. In any case, our parents were unconcerned about the nationality of their colleagues or neighbors. Today that question does concern us and sometimes even too much. One unexpected result of this research is already clear. According to Dmitry Rogozin, a cultural observer who teaches at Moscow’s Higher School of Economics, the emergence of the new “Internet group,” which didn’t exist even three years ago, is of great interest. People like that are far harder to manipulate, even when the state has a monopoly on the leading mass media. These people can always find an alternative point of view and draw their own conclusions. So now I can’t help wondering: Would these independent-minded people have appeared if perestroika hadn’t come about 25 years ago? It will probably take more time for us to be able to look back on that period dispassionately. So for gratitude, Mikhail Gorbachev will have to count not on the children of perestroika, but more likely on the grandchildren.